Promote your business while keeping your patients warm, covered and comfortable. After all, your patients value their modesty and their privacy. Comfort Product's modesty blanket is a cost-effective way to advertise your company for enhanced awareness and image building. Your patients will appreciate it, spreading your company name far and wide. Share these blankets with your physical therapists for added, low-cost company visibility. Blankets are custom-made of cozy, soft, machine-washable, heavyweight knit with your company name and logo in a single color; minimum three blanket order. It's just what you'd expect from the industry's innovation leader. Ongoing Care Solutions offers a complete line of orthotics, including the OCSI AFO (Ankle Foot Orthosis) Splints starting at $31.00 each! 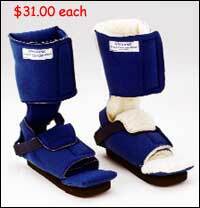 Our AFO's come in either Fleece or Smooth liners and are available in sizes small, medium, large, and extra large. The OCSI AFO Splints are SADMERC approved with code L-4396. Patients with joint trauma or upper motor neuron deficit affecting the elbow, wrist, or forearm position and/or function, often have difficulty regaining full supination/pronation motion with traditional rehabilitation. Designed specifically to help patients lacking supination and/or pronation movement, our newly improved Supronation component addresses this problem by providing active and passive traction therapy 24/7 in both directions, resulting in better functional outcome for the patient, at a very economical cost. The patented Supronation component is guaranteed for the life of the patient, is custom fabricated using patient's orthometry measurements, and is delivered in a quick 23 day turnaround. WBC Industries has you covered with SPT Technology Sleeves. SPT Technology's Carbon Braid Sleeves are designed to reduce weight and lay-up time on a lamination, while providing extra strength and rigid reinforcement. 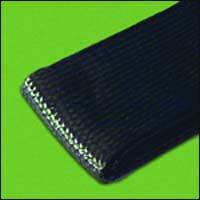 The 45-degree angle and woven tubular shape of the braid allows for easier angling around irregular forms. When properly engineered, carbon fiber advanced composites can achieve the strength and stiffness of metals at significant weight savings. SPT Technology PVA Sleeves do everything the high-price brands can do. It's the same polyvinyl alcohol quality you expect--100 % guaranteed, at a fraction of the cost. The PVA sleeves are, all 40" in length and 3mm thick (the standard for the O&P industry). New and in stock, six bright new colors of metallic foil laminated brace, belt, strap, and cuff leather. These 4 1/2 ounce "medium weight" leathers are perfect for jazzing up cuffs or straps. If you have a youngster who would like to kick it up a notch, try one of these new colors; hot pink, bright red, purple, navy, turquoise, and green. Spinal Solutions introduces the first, rigid spinal support system designed to maximize patient compliance while allowing the practitioner the flexibility to provide an intimate fit. 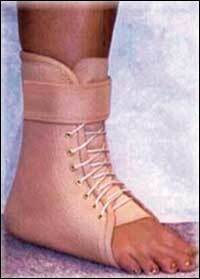 The VertiLok features a two-stage closure procedure that allows the patient to don the orthosis without assistance. By securing the built in corset first, which is attached to the posterior panel, immediate abdominal compression is achieved, and the patient is able to secure the anterior panel without assistance. In the later stages of recovery, the patient can be weaned off the rigid anterior panel. The VertiLok is made of a lightweight, breathable, and washable material. The orthotic device is MRI compatible. Removable anterior/ posterior (lined with 3/16" aliplast), and lateral panel inserts come in a wide variety of configurations that are heat moldable. The three-point closure system produces uniform, abdominal compression with just two straps, which attach to the anterior panel and have large D rings for better grasping. The LSO version is easily converted to a TLSO by adding the optional Posterior Thoracic Extension (PTE) and the Sternal Pad Kit (SPK). Dorsal Strap Kit (DSK), Hip Spika Attachment (HSA), and Inflatable Lumbar Chamber (ILC) are also available. 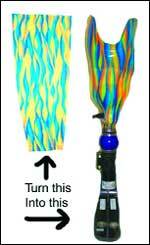 For patients who want a bold new look for their socket, SleeveArt® by Fred's Legs now offers laminating sleeves. These laminating sleeves, made from Lycra® Spandex, are available in a variety of designs. Fred's Legs makes it easy for practitioners to simply pull the laminating sleeve over the mold before final lamination. Fred's Legs offers three standard sizes (S, M, & L) with custom sizing available. The sleeves come in a standard length of 16", are cone shaped, and are unfinished at the top and bottom. A longer 20" laminating sleeve is available upon request at no additional cost. All laminating sleeves are priced the same at $25. After 2 years of research and development, Acor introduces a major enhancement to its comfort footwear line. The entire line of Acor footwear is now fully lined with a unique silver fiber called X-STATICTM. The entire line of Acor footwear has been renamed SOLE DEFENSE Footwear®. The individual names of each shoe (Broadway, RiverWalk, Comfort Street, Spring Street, and Activz) will remain the same. PEL Supply Company has the new Ratchet Lock from Becker Orthopedic, in stock and available for immediate shipment. According to Becker, the Ratchet Lock is designed to promote full knee extension by providing knee stability to the user through an incremental range of knee flexion. The joint features a secure, semi-automatic locking mechanism that can be quickly and easily disengaged. 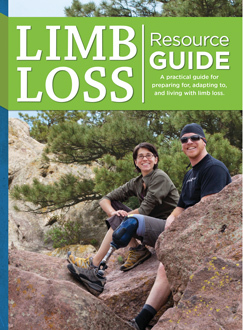 The variable flexion knee lock has ten different locking positions in nine-degree increments. PEL Supply will ship the Ratchet Lock fully assembled in adult and child sizes. There is a choice of aluminum, stainless steel, or titanium round edge uprights. 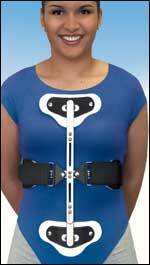 OPTEC Inc. introduces the ATL Hyperextension Brace. The strong yet lightweight aluminum design can be easily modified to provide a custom fit. The height and circumference of the ATL braces can be instantly adjusted to conform to your patient's body dimensions and fit well under their clothing. Soft pads cradle the pectoral/sternal region eliminating impingement to the neck region while providing comfortable firm support. 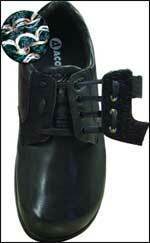 Universal & adjustable dual front closure design reduces rotation when donning brace. Slotted bars allow for quick and easy custom fit. Fillauer LLC announces the King Pin Lock. 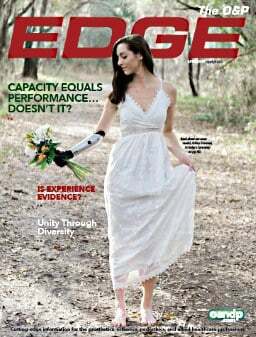 CPI's new Adjustable Stride Control allows prosthetists to customize an individual's gait without the need to change soft components. The Stride Control adjuster, located on the back of the foreheel, determines preload on the bumpers. Convenient adjustment, from the top or the side, increases or decreases resistance. Align perfectly the first time, and every time, with College Park Industries' Adjustable Stride Control. 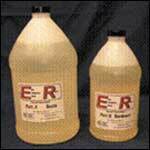 Prosthetics Research Specialists Inc. introduces E-R Resin, a new type of two-part Epoxy blended resin. E-R Resin works just as well under water as it does with no moisture present. This means no more fuzzy laminations due to wet casts or PVA bags that were not dried properly. E-R Resin is heat adjustable so you can make future adjustments. Per ASTM Standards, at independent lab testing, it was by far the strongest of the four popular resins we tested. Best of all, E-R Resin works out to be the most economical, and offers a 14-minute working time. The original gold standard attachment kits from ProAdvantage® just got better with ClickLockTM--an audible locking mechanism that enhances patient safety and security. Fully tested, the new ratchet mechanism was subjected to a pulling force strong enough to cause the suspension liner to detach from the patient's limb, yet the ratchet mechanism held. The ClickLock features a positive one-way clutch offering maximum safety from loss of suspension due to clutch gear reversal or slippage. Even if the clutch fails, the ratchet can suspend loads in excess of 300 pounds. ClickLock comes standard in all 600 and 650 series kits (replacing the ProAdvantage 500 and 550 kits). The ClickLock cartridge is retrofittable into ProAdvantage 500 series attachment kits and many other similar kits including AlpsLocks and SPS 500 kits. The cartridge is available separately. Cascade Orthopedic Supply now offers customers access to the Breg orthotic product line, including the X2K knee brace (shown) with its diamond design for ACL and PCL support. Well known in the orthopedic industry, Breg products are well made and properly designed to fit. 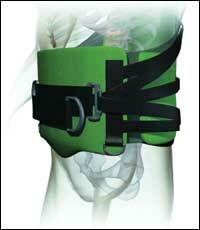 In addition to the X2K brace, Cascade can supply post-op braces, soft bracing, PTOs, and upper extremity bracing. The new Polar Care continuous cold therapy systems come in a variety of sizes. Accessories are also available.